Editor's Note: Michigan's secondary just can't get a break. I swear I am so sick and tired of posting these damn transfer posts. One and done. Emilien to transfer. It's being reported that Michigan freshman safety Vladimir Emilien requested a transfer from the program yesterday and was granted it. Incase you're asking yourself, "Who? ", Emilien played sparingly in the 2nd half last weekend against UConn in his first ever game. He's a red-shirt freshman from Plantation, FL. 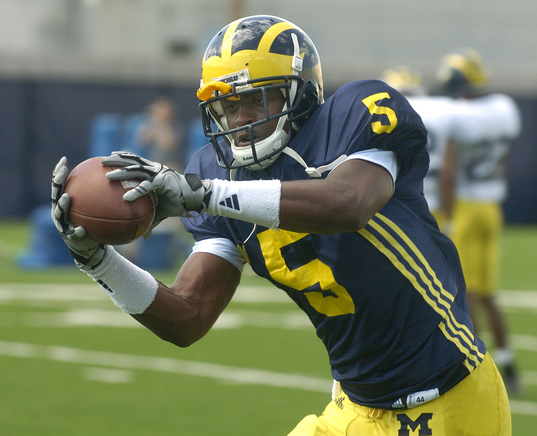 Sophomore safety Vlad Emilien has left the Michigan football team, Scout.com learned Wednesday morning. Emilien, out of Plantation, Florida, requested, and was granted, his release Tuesday in a meeting with head coach Rich Rodriguez. Emilien will have three years of eligibility remaining, over the next four years, although his next stop is not known. So...this means that our depleted secondary just got more depleatederer. So if Cam Gordon goes down at FS, Marvin Robinson will be moved to starter so we don't have to move Kovacs over to FS where he played miserably last year. Brian at mgoblog suggests a knee injury that just never healed right may have been the key to the transfer. It may have been the writing on the wall that lead Emilien to realize he couldn't beat out a walk-on for playing time. However, it's only week 2 of his first season...so something else could be at play here.